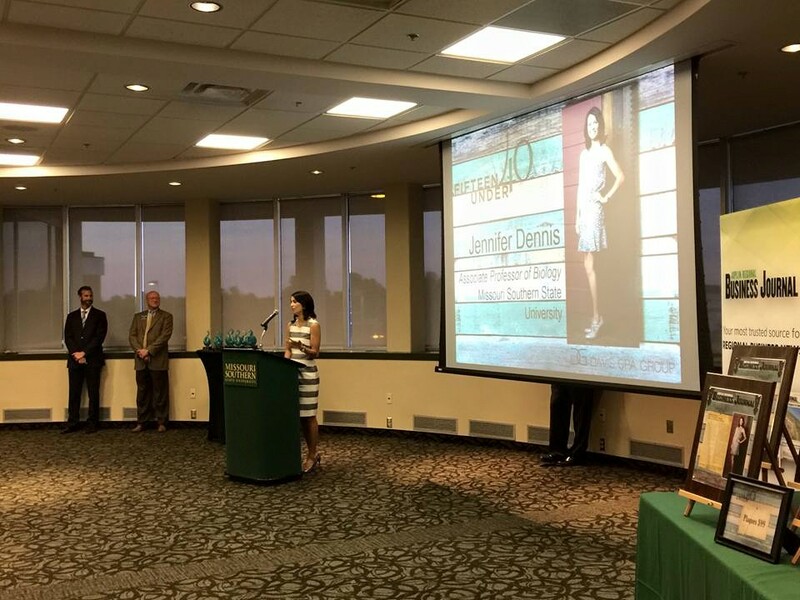 Dr. Jennifer Dennis was among those recognized during the Joplin Regional Business Journal’s 2016 class of Fifteen Under 40. Dr. Jennifer Dennis speaks during Thursday evening’s 15 Under 40 presentation. The ceremony, held Sept. 1, in Connor Ballroom, marked the fifth year for the publication’s celebration of those who are making an impact on their community. Nominations are submitted by peers and colleagues, with the honorees selected by an independent panel of judges. While the Joplin Area Chamber of Commerce offers recognition of the role that businesses play in the community, “the Business Journal feels like recognizing individuals is also important,” said Larry Warren, publisher. In introducing Dennis for her award, Carthage Police Chief Greg Dagnan – emcee for the event – cited her contributions to textbooks, articles that have been published and volunteer work. Dennis thanked the Business Journal for their support of young professionals in the community, as well as her husband and family.